Component of the MRE11-RAD50-NBN (MRN complex) which plays a critical role in the cellular response to DNA damage and the maintenance of chromosome integrity. The complex is involved in double-strand break (DSB) repair, DNA recombination, maintenance of telomere integrity, cell cycle checkpoint control and meiosis. The complex possesses single-strand endonuclease activity and double-strand-specific 3'-5' exonuclease activity, which are provided by MRE11A. RAD50 may be required to bind DNA ends and hold them in close proximity. NBN modulate the DNA damage signal sensing by recruiting PI3/PI4-kinase family members ATM, ATR, and probably DNA-PKcs to the DNA damage sites and activating their functions. It can also recruit MRE11 and RAD50 to the proximity of DSBs by an interaction with the histone H2AX. NBN also functions in telomere length maintenance by generating the 3' overhang which serves as a primer for telomerase dependent telomere elongation. 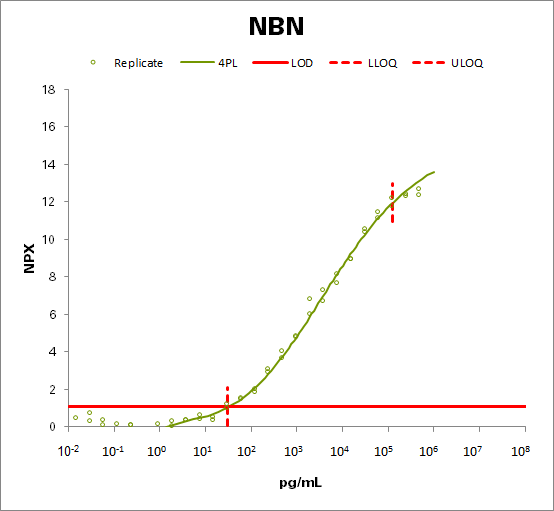 NBN is a major player in the control of intra-S-phase checkpoint and there is some evidence that NBN is involved in G1 and G2 checkpoints. The roles of NBS1/MRN encompass DNA damage sensor, signal transducer, and effector, which enable cells to maintain DNA integrity and genomic stability. Forms a complex with RBBP8 to link DNA double-strand break sensing to resection. Enhances AKT1 phosphorylation possibly by association with the mTORC2 complex.